compatible with standard VNC software, conforming to RFB protocol specifications. make sure nothing wrong is happening on your computers when you are away. 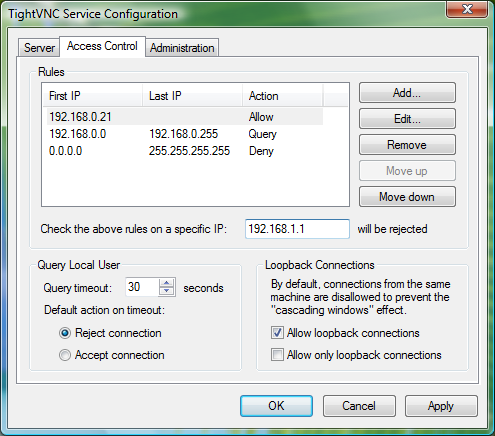 TightVNC Server 2.0 allows configuring IP access control rules. Once the rules are set up, you can check which action would be taken for some particular IP address. So you can test the rules before they will take effect. Configuration window, Administration tab. 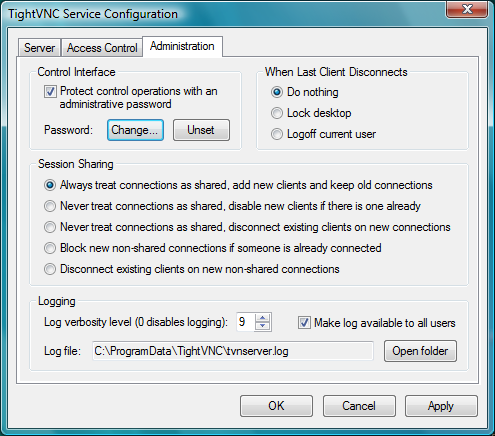 As you can set administrative password to protect TightVNC Server from being re-configured or shut down by any user. It is recommended that you set such a password for the service. This window demonstrates improvements in the user interface. The window documents itself, remembers past connections and provides an option to attach viewers in view-only mode. Server for Windows: Implemented performance improvements that may notably increase update speed and optimize CPU usage. Viewer for Windows: Fixed a problem that might cause the viewer to continue sending keyboard events even after minimizing a full-screen window (sf bug #1433). Viewer for Windows: Fixed an incorrect calculation in keyboard handling, which unlikely caused any problems though (sf bug #1422). Source Code for Windows (Server and Viewer): Migrated to Visual Studio 2015 and MSBuild tool set as the primary build environment. 1,088 4,318 TightVNC Software <img src="http://www.oldergeeks.com/downloads/gallery/thumbs/tightvnc_th.png"border="0"> Aug 21, 2018 - 11:06 2.8.11 2.23MB MSI , out of 21 Votes.